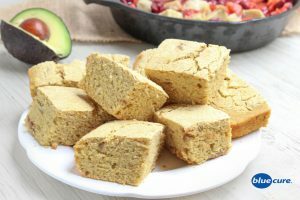 I wouldn’t necessarily put cornbread in a health food category, at least the kinds you’ll likely find served at restaurants or made from packages. Many variations use white flour, butter, sugar, and buttermilk. Cowboy Cornbread surpasses all the storebought variations— and is actually made of healthful ingredients. Whole grains, seeds, and fruit! Don’t let “healthy” scare you— this variation is dense, moist, and not lacking in flavor. It pairs great with our Blue Cure Texas Chili and avocado. Give it a try, tell us what you think! *Whole wheat flour works too, the pastry flour is just a little lighter. In a bowl, combine the cornmeal, whole wheat flour, and baking powder. Stir until evenly mixed. In a small bowl, combine ground flax and water. Set aside to let it thicken. Remove the pits from the dates. Add to a blender with ¼ cup hot water and soy milk. Blend until smooth. Add the flax and date mixture to the bowl with the flour. Mix with a spoon until well combined. Lightly coat an 8 x 8 pan with a small amount of oil, such as avocado oil. A glass pan is preferable. Pour the batter into the pan and spread until evenly distributed. Cook the cornbread for 25-35 minutes. Allow to cool and then enjoy!